Today: Instead of defaulting to whatever's on sale at the corner market, scoop up a few specific blooms and see what containers you have on hand. We've got a style for every personality. Most people are afraid of flowers. Or at least, they're afraid of *flower arranging*—a frightful activity that feels akin to sheep-shearing, in which sharp objects and pretty fluffy things combust in a muddy disaster that never seems to end well even if it's done right. 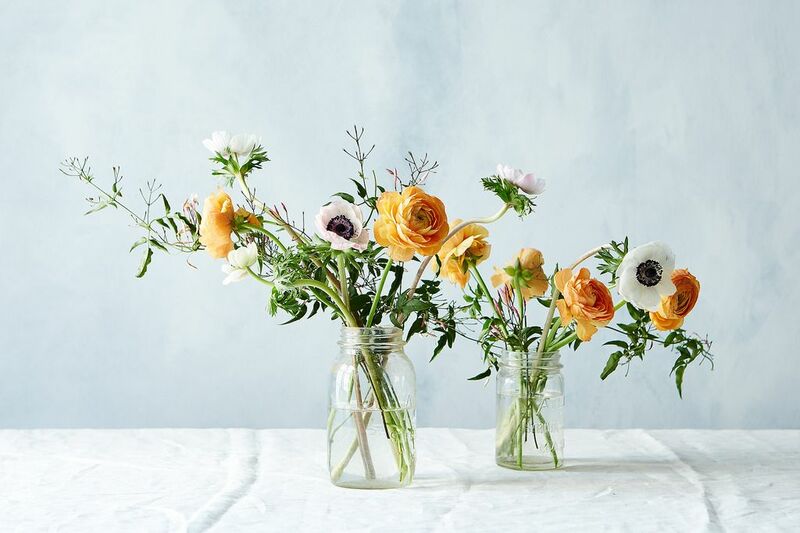 Let's step back, carefully: Buy healthy blooms, and let your flowers fall whichever way they want to; you don't need tape, floral foam, chicken wire, or fancy vases to make jaw-dropping arrangements. You love to entertain and pull it off with regular excellence, but you're always playing it down with impossible stories of happenstance (These old plates? Found them on the curb for free!). A quirky splay of alliums delivers that wow factor you require, with little to no actual styling required—perfect for getting a reaction while you prepare your best oh, please face. 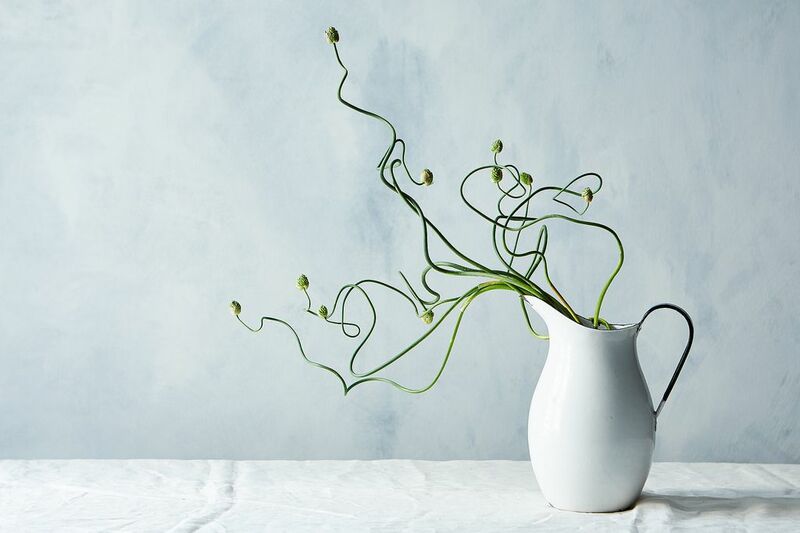 There are hundreds of species of alliums—including, of course, edibles like garlic, scapes, shallots, and leeks—so you'll want to ask a florist for the fragrance-free type that grows long, strong, and curly like these. Just set them in a pitcher with water and let the wiggly stems spill out the spout. They'll reach around like a yawning body without any help from you, so you can concentrate on other elaborate decorations that you'll tell people take "no time at all!" If you don't hold anything back, consider a like-minded flower. 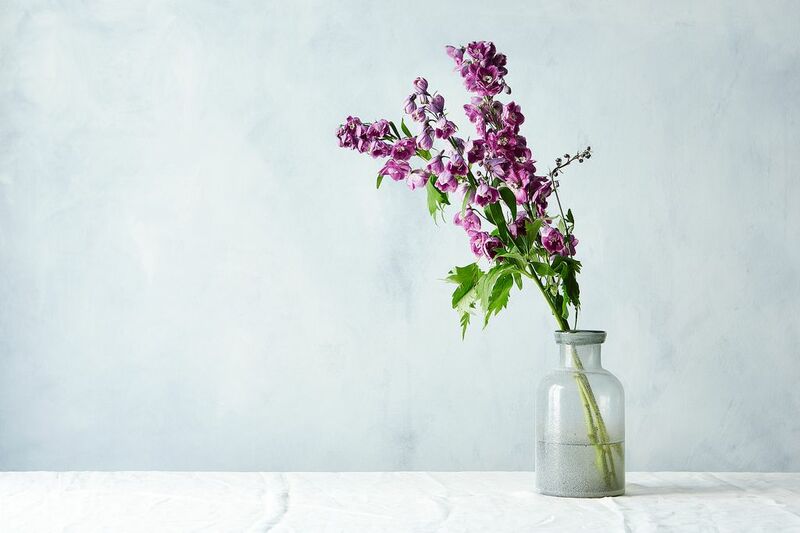 Tall, regal delphinium is commonly known as larkspur, and it comes in an array of unabashedly bold blues and purples with papery, toothed leaves. The colors are saturated (this is the lo-fi filter of flowers) and, while the stems ring in at impression-making 3 to 5 feet tall, they're less expensive than cherry or quince blossom branches. Find a tall, heavy vessel that will stand up to the weight of the leaning stems (countertop drink dispensers or big cookie jars would work well), and snip the ends so the leaves begin an inch or so above the rim of the glass, varying each by a few inches. Classic tufts of hydrangea are crowd-pleasing flowers, though their lifespan can range depending on conditions (often they'll wilt quickly once cut, but after this shoot, ours dried out without drooping, holding their shape and color for weeks). 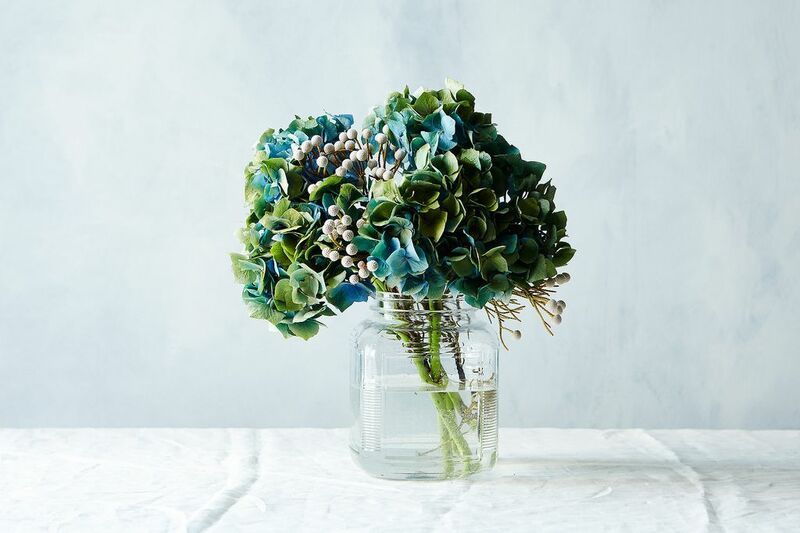 Like flowering litmus tests, the color of a hydrangea bloom is determined by the pH of the soil it was grown in—they range from winey purples to rich pinks, sky blues, sea greens, and white. If you're intrigued by this kind of experiment speak, or are the kind of person who actually enjoys testing the chlorine levels in a pool, these might be the flower for you. Choose a wide, stout jar, and cut them so the blooms bubble right over the edge in a great cluster. If you can't resist a tidy bunch of daffodils (or any narcissus that coyly droops its petals like a chin) when you catch the surly perfume of their scent, indulge freely—these buds are spring in a nutshell. But like their namesake Narcissus, who so loved his own reflection, these flowers are to many a symbol of vanity—though they'll get you many likes if arranged creatively. In fact, daffodils are a regular mean girl of classic beauties: They leach a poison that can shorten the lives of whatever they're arranged with, so choose supporting plants wisely. Snipped at a range of heights, they'll branch out from the pack quite naturally, and a few crochety twigs from the backyard will balance out their faux-happy vibes like a welcome reality-check. 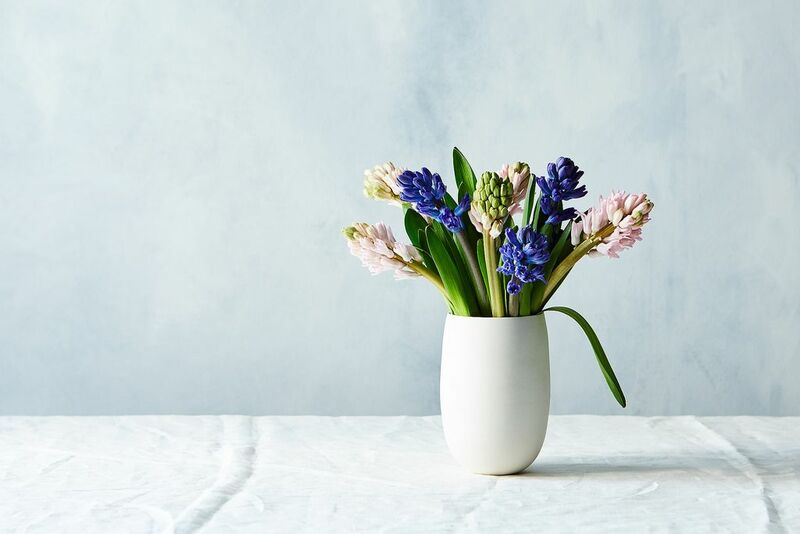 Hailing from the eastern Mediterranean, hyacinths are rearing their heads now that the weather is warmer. It's traditional to plant them in a tight cluster, as their flowering "spikes" sprout straight up from the earth in even heights. 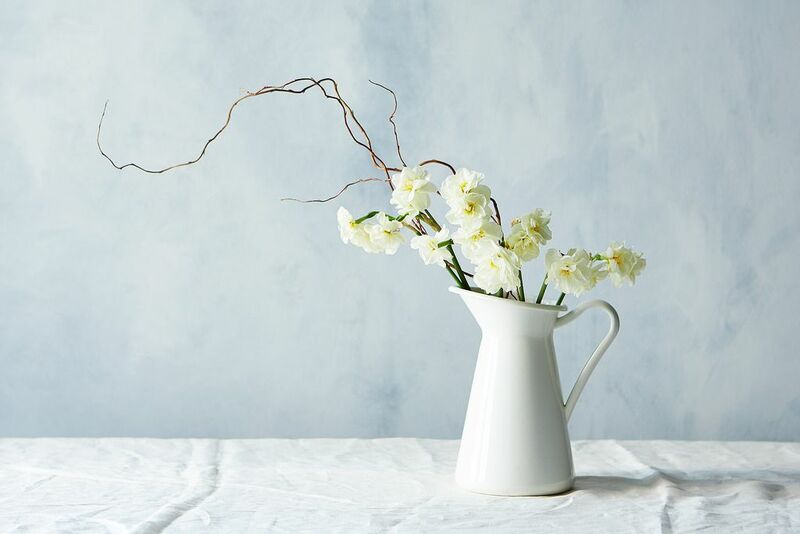 If you can't be bothered to hold your flowers' hands as they settle this way or that into an arrangement, simply group a few colors of these buds in a clean ceramic vessel. If a leaf flops over the edge, call it "character" and carry on with whatever new task you were already on to, since this one took all of 3 minutes. We in the office are quite fond of the pencil cactus, which is not a flower at all but a wiley desert plant that's beautiful (in it's own way), with spindly branches that heap to one side like a healthy head of dreadlocks. You might know that the milk it drips when a branch is broken can irritate your skin, but there's an upswing to the accident. 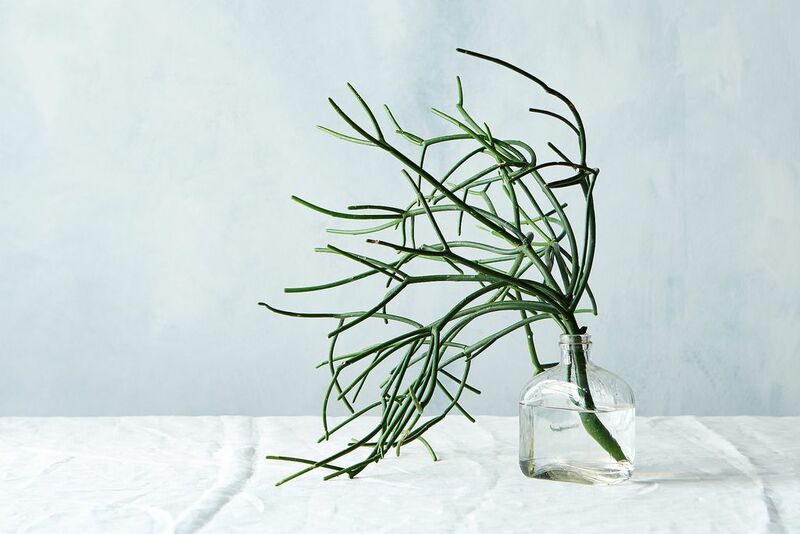 Placed in a jar of water (with a small opening to keep the plant upright), a lost limb of the pencil cactus will carry on—with a little more levity to its branches than a whole plant. It lives and lives against all odds, and will make you happy even if you tell everyone, "Ugh, I hate that thing." We know you don't. You each do your own thing, but at the end of the day you're family; so it is with anemones and ranunculus, two genus of the Ranunculaceae family (delphenium is another!). For this textural arrangement, be brave and choose two related but dissimilar flowers—our orange ranunculus and pink-and-white anemones don't seem like they'd work together at first glance, but come together like the last gasp of a sunset. Something brambly, like a few sprigs of jasmine, will play peace-keeper, filling any awkward silences when the kids can't seem to agree on anything. What are your favorite spring flowers and tricks for arrangements? Tell us in the comments! Sorry didn't finish...sweet peas are my absolute favorite! But I plant random seed mixes every years and mix with my landscape agapanthus and roses. Also bougainvillea make a fantastic dried flower! I re-read this article several times, and laughed every time. What great, subtle, wicked "flower humor!" Sent it on to my flower-loving friends. Especially love the last entry: "For Siblings Who Feel Confident the Other was Adopted." Funniest thing I've heard since the last John Oliver episode. Peonies... I can't get enough of them in season! Tulips and monkey grass. Actually, just about any flower and monkey grass.